The Paresev, once a possible replacement for the parachute, was not a realistic alternative. 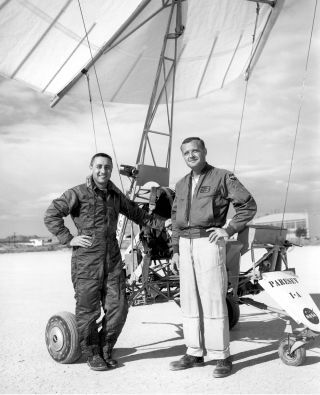 In this historical photo from the U.S. space agency, the Paresev 1-A is pictured standing on Rogers Dry Lakebed at the NASA Flight Research Center, Edwards, Calif. Mercury astronaut Gus Grissom is at left and NASA test pilot Milton Thompson is at right. The Paresev was evaluated as a potential replacement for parachutes used on spacecraft. The Paresev was steerable and was evaluated for use on the Gemini spacecraft. The idea was not workable, however.